Methylenetetrahydrofolate reductase (MTHFR) is an enzyme involved in the transformation of 5-10 methylenetetrahydrofolate into 5-methyltetrahydrofolate which serves as a methyl donor for homocysteine methylation to methionine through the intervention of vitamin B12. MTHFR mutations (autosomal recessive transmission) are rare and can cause severe deficiency of MTHFR with enzymatic activity reduced to less than 20% and appearance of homocysteine and homocystinuria and low blood levels of folic acid. 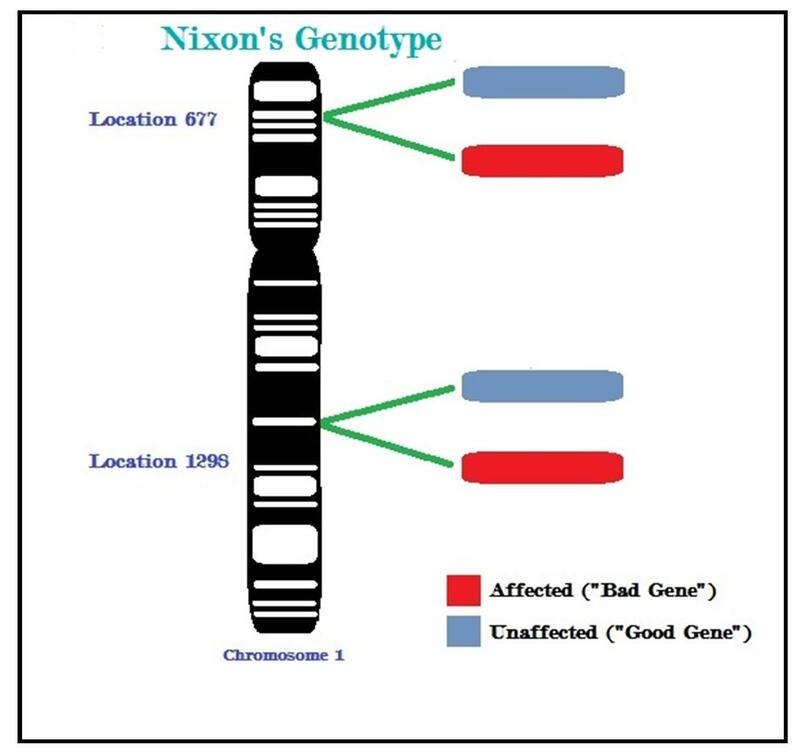 The most common genetic mutation is a genetic polymorphism, known as MTHFR C677T, due to the substitution of a C (cytosine) for a T (thymine) at nucleotide 677 (C677T), which causes a substitution of an Alanine to a Valine in the final protein and a reduction of the enzyme activity of MTHFR from 50%, up to 70% in conditions of exposure to heat (heat-labile variant) . This variant involves high blood levels of homocysteine after oral intake of methionine. This mutation is quite common, with a carrier frequency of 31% to 39% (homozygote frequency 9%-17%) among the white North American population. Recently, a second mutation in the gene MTHFR (A1298C) has been associated with reduced enzyme activity (about 60% rate; 40% if present in association with the C677T mutation). Hyperhomocysteinemia is a medical condition characterized by an abnormally high level of Homocysteine in the blood, conventionally described as above 15 µmol/L. Homocysteine is a non-protein α-amino acid. It is a homologue of the amino acid cysteine, biosynthesized from methionine . Homocysteine can be recycled into methionine or converted into cysteine with the aid of certain B-vitamins. In hyperhomocystinuria from MTHRF, blood values are higher by 10 to 50 times. Elevated homocysteine levels are a known risk factor for cardiovascular disease and thrombosis. It has also been shown to be associated with microalbuminuria (strong indicator of the risk of future cardiovascular disease and renal dysfunction). Elevated homocysteine levels are related to Alzheimer's disease. Oxidative stress induced by homocysteine may also play a role in schizophrenia and delayed psychomotor development. In brain tissue homocysteine levels triggered significant genotoxic stress (DNA fragmentation). The brain has a limited capacity for homocysteine metabolism. The level of 5-tetrahydrofolate in the cerebrospinal fluid is 3 times higher than the plasmatic level and there exists an active process to maintain it. Methionine synthase is the only enzyme in the brain that is capable of converting homocysteine to methionine. Elevated levels of homocysteine have been linked to an increased risk of fractures in elderly persons. ➢Pregnancy is already characterized by physiological hypercoagulable state. Inherited thrombophilia may be responsible for about 50% of thrombosis during pregnancy and post partum. This mutation is also correlated with a higher frequency of spontaneous abortions. ➢Hyperhomocysteinemia is correlated to an alteration of folate metabolism (vitamins of group B) with a consequent increased risk of neural tube defects in the fetus; the most common abnormality is spina bifida. Elevated plasmatic homocysteine level gives an endothelial dysfunction by the reduction in nitric oxide bioavailability. The uncoupling of nitric oxide synthase activity and quenching of nitric oxide induce oxidative stress. This leads to eventual endothelial cell apoptosis and chronic inflammation/prothrombotic conditions. This dysfunction can easily be monitored by flow-mediated dilation method using ultrasound. Homocysteine can cause cardiovascular disease by different mechanisms such as damage on vascular endothelium (endothelial dysfunction, oxidative damage, an increase of the synthesis of collagen and deterioration of arterial wall elastic material) and an increase in proliferation smooth muscle cells. •High prevalence of hyperhomocysteinemia in the general adult population may be a risk factor for hypertension associated with both diastolic and systolic blood pressure , particularly in males rather than in females. significantly correlated with low status of folic acid and vitamin B12 in CHD patients. As we said there is a close correlation between the lack of certain vitamins such as folic acid, vitamin B6, and B12, and the plasma levels of homocysteine. Therefore we must pay particular attention to daily micronutrients with a balanced diet. • in patients that require treatment with vitamin supplementation. The aim is to reduce plasma levels of homocysteine so that the related risk factors and associated clinical conditions can be modulated. The diet for high homocysteine should include: meat, eggs and fish for a proper intake of cobalamin, and vegetables (especially green leafy raw) to have the right levels of folic acid. Riboflavin and pyridoxine are almost ubiquitous. However, consuming a daily portion of milk is guaranteed the proper intake of vitamin B2 and B6. If the diet described above is not sufficient to guarantee the proper intake of vitamins, it must be considered the use of multivitamin supplements. This occurs in conditions of a homozygous mutation of MTHFR. We can suggest multivitamin supplements (typically contain also other important vitamins, such as A, C, D, and minerals such as Zn and Fe), or targeted integrations (B vitamins, such as B6, B12, folic acid). Pregnant women with a homozigous MTHFR mutation must take supplements of vitamins B6, B9, B12 and folic acid. This therapy should start at least 4 weeks before conception and should be continued during pregnancy to reduce the risk of thrombosis. •Homozigous MTHFR mutations are a risk factor for cardiovascular diseases. The association between cardiovascular diseases and high homocysteine levels may result from deficiency of B vitamins or it may only alter vascular reactivity when folate is simultaneously low. On contrary, low levels of folate are associated with alteration in vascular reactivity without homocysteine concentration changes. For this reasons a periodic check of homocysteine levels, a healthy lifestyle and folate supplemets are recommended for patients with MTHFR mutations. • Can homocysteine be a biomarker or a risk factor? Current guidelines have not classified homocysteine as a cardiovascular disease risk stratification. Some studies show that homocysteine fulfils the criteria to classify it as a “novel” biomarker (elevated Homocysteine concentration predicts future CVD and CHD events and plasma Homocysteine levels enhance risk prediction when added to the FRS, enabling the reclassification of a significant number ofindividuals at “intermediate risk” of CHD events), although lowering homocysteine levels in individuals with pre-existing cardiovascular disease has not shown any benefit. Homocysteine is an emerging new risk factor for cardiovascular disease. It is a thiol compound derived from methionine and involved in two main metabolic pathways: the cycle of activated methyl groups, requiring folate and vitamin B12 as cofactors, and the transsulfuration pathway to cystathionine and cysteine requiring vitamin B6 as cofactor. 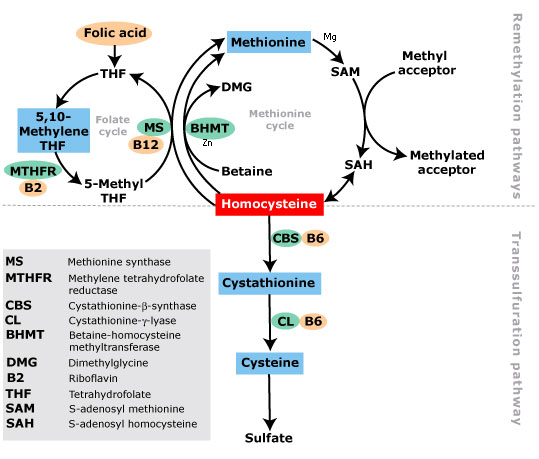 The homocysteine metabolism represents an interesting model of gene-environment interaction. Elevations in homocysteine may be caused by genetic defects in enzymes involved in its metabolism or by deficiencies in cofactor levels. A common polymorphism in the gene coding for the 5,10-methylene tetrahydrofolate reductase (MTHFR) (C677T, Ala --> Val) is associated with a decreased activity of the enzyme due to thermolability. In case of homozygosity for the Val allele, a relative deficiency in the remethylation process of homocysteine into methionine leads to a mild-to-moderate hyperhomocysteinemia, a condition recognized as an independent risk factor for atherosclerosis. The genetic influence of the MTHFR polymorphism on homocysteine levels is attenuated in females in premenopausal age and is not significant in subjects who exhibit serum levels of folate and/or vitamin B12 above the 50th percentile of distribution in the general population. The prevalence of the Val/Val genotype varies among different ethnic groups. It is very low in African populations, whereas in Europe and North America it ranges between 5% and 15%. In Italy an even higher prevalence has been reported in some regions. The question whether the MTHFR polymorphism might be per se an independent contributor to cardiovascular risk is debated. The interaction between this or other genetic factors and environmental/nutritional conditions (i.e. intake of vitamins such as folate) is a key determinant for homocysteine concentrations in healthy conditions as well as in some disease (i.e. in renal disorders). Another example of gene/environment interaction in the field of atherosclerosis is given by the apolipoprotein E polymorphism and its influence in response to diet. The presence of a high prevalence of risk-related allelic variants of such candidate genes within a certain population could serve to locally reinforce the recommendations concerning nutrient intake.